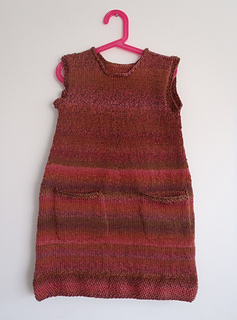 This simple sleeveless A-shape dress is knitted from bottom to top. The pockets are knitted first and joined with the body as you work on the dress. For the arm openings the front and the back of the dress is knitted separately and joined on shoulders by grafting with Kitchener stitch. The stitches around the arm openings are picked up and finished with seed stitch, while an I-cord is attached around the neck opening. If you prefer longer dress, add extra rounds before the pocket section. If you prefer longer torso, add extra rounds to the sections where only 1 round is knitted between the decrease rounds. In that case you will need more yarn than stated.